Voice Talents: Daveigh Chase (Lilo); Chris Sanders (Stitch); Tia Carrere (Nani - Lilo's Sister); Jason Scott Lee (David - a muscular, tanned character who sells surfboards); Kevin McDonald (Pleakley - bounty hunter); David Ogen Stiers (Jumba - bounty hunter); Ving Rhames. (Cobra Bubbles); Laurie Metcalf (Mell & a Maid in Lilo's home). "Lilo and Stitch" will have one orignal song called "Aloha Spirit". As of August 8, 1999, just begun pre-production at the Orlando studios. The following story was taken from Ain't It Cool News: Sir Col-erase here with the latest scoop from deep inside animation land, namely the green hills of Glendale. Yesterday I went to an animation lecture by Disney's Andreas Deja (yeah, the guy who gave us Gaston and Triton and Hercules and Scar and Jafar and a bunch of other great characters). It was pretty interesting, especially what he had to say about the next feature that will come out of the Florida studio (the good people who gave us Mulan). As most people know, Andreas left the Kingdom of the Sun project after working on that troubled film for about a year and a half, and now he's devoting himself to the next movie from Orlando. Hold on to your hats, because this sounds like quite a change of pace for Disney. It's not going to be the usual teen-age/love story/epic/fairy-tale/musical/coming-of-age thingie. It's going to be called Lilo and Stitch (the spelling may be off). Lilo is a 5 year old Hawaiian girl who's a little peculiar. Maybe a lot peculiar. She has an off- beat take on life, and is a little obsessed about taking care of downtrodden animals. For example, she collects cans and bottles to recycle from the beach, and buys fish food with the money she makes, then paddles out in the ocean to feed the fish there! Meanwhile, on a distant planet, alien authorities have captured the most dangerous of all criminals, and are sending him via rocket to a prison planet. This is Stitch. He's a tiny little thing, with 6 legs, and looks a bit like a dog. The rocket crash lands on Earth, Stitch escapes, and ends up in an animal shelter. He's a brilliant manipulator, so he figures out that if he can pass for a dog and get adopted, then the alien police dudes will have trouble finding him. Of course Lilo sees him and, since he's obviously the most unusual and needy of all the dogs, she takes him home. He tucks two of his legs up under his fur or whatever so he looks more dog-like to her. While the aliens try to find him, he hangs out with Lilo during her funky little adventures. Would you be surprised to learn that through her innocent and trusting and idiosyncratic treatment of him, Stitch develops a heart? I thought not. This is Disney, after all. This sounds like a pretty bizarre story for Disney, but Andreas seemed to be on the level. He said it's going to be in a more cartoony style and suggested it would be similar to the animation style of an old Disney animator named Freddie Moore. And it's not a musical, though they're going to try to buy the rights to a couple of Elvis songs, because Lilo likes to hula dance on the beach to Elvis music. The story was cooked up by one of Disney's top story guys, Chris Sanders, who created an illustrated story outline that everyone fell in love with. If you want a sense of what Sanders can do, check out his work in "The Art of the Lion King" book. Andreas called it the best story he's seen since he's been at Disney! Sounds good to me. Andreas said the project had just been announced, and so was okay to talk about, but I haven't seen any mention of it elsewhere yet." Information from The Ultimate Disney Animation Archive. "Production is under way on the Walt Disney Co.'s animation feature 'Lilo and Stitch,' the story of a little Hawaiian girl whose adopted dog turns out to be an evil space alien. Jason Scott Lee and Tia Carrere will lend their voices to the project, which is targeted for a 2003 release, sources said. The studio is tight-lipped about the project, which is currently being worked on at Disney's Orlando animation studio. 'Lilo' has been in the early stages of development for quite some time, and some of the production work is being done in Hawaii, sources said. Lee will voice a muscular, tanned character who sells surfboards. Carrere's voice will be heard as Lilo's sister. Chris Sanders, who came up with the story, is on board to co-direct with Dean Deblois. Sanders has worked with Disney animation for more than a decade. Studio chairman Peter Schneider and Disney Feature Animation president." -- from the Hollywood Reporter. "Scheduled to open in June 2002 in the USA and September 2002 in Australia. Characters: Lilo: little Hawaiian girl with a vivid sense of imagination and loves Elvis Presley music. Both Lilo and her older sister Nani are orphans. Nani: Lilo's 19 year old sister. She works hard at keeping the family together. Stitch: Experiment 626. He resulted from an unauthorized Genetic experiment. He has no ability to care and is the ultimate fighting machine and the destroyer of cities. Jumba: was the alien responsible for the genetic experiment that created Stitch. Pleakley: is Jumba's assistant and has only learned things about Earth from a view master. 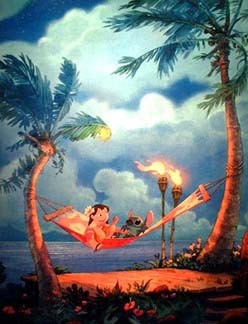 The story opens with Lilo at the beach and swimming and then realizing she is late rushing to her hula class. She gets into trouble and her sister Nina races home to see what trouble she has been in. She finds the door locked and nailed in place by Lilo and we see Lilo lying on the floor next to her record player listening to Elvis songs as Nani tries to get in. (Disney has licensed 7 Elvis songs for the movie. Three of them are: Heartbreak Hotel; Hound Dog; Devil in Disguise). As Nina tries to get in the house, Mr Bubbles the social worker, arrives to see how Nina and Lilo are doing. What he finds in a great animated sequence does not install much trust in how Nina is looking after her sister. The scene changes and we see Stitch imprisoned on a penal ship in outer space. He escapes the ship after a series of classic sequences and eventually crash lands on Earth. After crash landing on earth he wonders onto a busy road and gets run over by a semi trailer. As he is virtually indestructible, but his weapons are destroyed. Now unconscious he is taken to an animal shelter by the owners of the truck. In a very funny sequence the other animals in the shelter are petrified of Stitch. The next morning Nina takes her sister to the hospital to get a pet. Lilo borrows money from her sister to buy a pet. Lilo wanders out the back of the shelter to find a pet and she can't find any animals in the cages as they are all hanging from the rafters afraid of Stitch. She finds Stitch who has transformed himself into a Blue Dog. He goes with Lilo to use her as a shield against Jumba and Politely who are hunting him. Later we see a classic animated sequence when David, Nina's boyfriend, takes them all to the water and Nina, Lilo and Stitch go surfing. There is great animation in this feature and (watercolors) used in the coloring of all the cels. There is a real heart to the story of the relationship that develops between Lilo and Stitch." Information from Aint-It-Cool-News.